When SuperPatriot made his return as a cyborg, the hero assaulted the three villains that had crippled him but also attacked Dragon in the process. The injured police officer was taken to Hillman Hospital to recover where Inferno carried out an assassination attempt. He was thwarted with relative ease and sent to prison. After escaping incarceration, Inferno clashed with the vigilante Star on two separate occasions before fighting for a third time during the Gang War. Once this civil war within the Vicious Circle was over, Inferno accepted a position in Chelsea Nirvana’s Frightening Force that made a failed attempt to annihilate Freak Force. When CyberFace conquered the whole of Earth, Inferno was part of the Vicious Circle faction that was abandoned in the devastated Chicago. They were recruited by Dragon as part of his rebellion, successfully overthrowing the dictator. Inferno remained with the Vicious Circle but promised his wife that he would leave his criminal life behind soon. 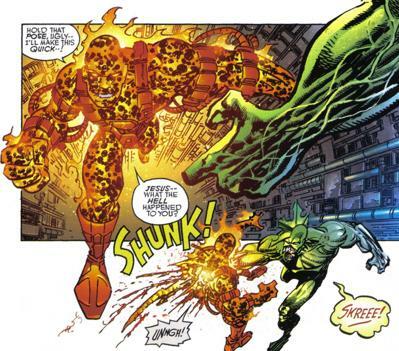 This never happened though as the monstrous Virus killed him as it massacred a group of villains, but it also absorbed Inferno’s powers in addition to some of his memories.